I watched the remarkable Melanie’s interview at Sixty and Me, about women borrowing elements of men’s dressing. Androgyny has always been an aesthetic I’ve appreciated. I enjoy the contrast of a feminine face, with full lipstick, with a man’s blazer, trousers or shoes. Today’s look mixes very feminine elements – a wide, swooshy skirt (similar) and curly hair (thanks to Ellen Wille’s Wiki) – with a plain oxford button down, Neil Armstrong tie, and masculine brogues. It’s borrowing from the boys in a way that still feels authentically “me”. 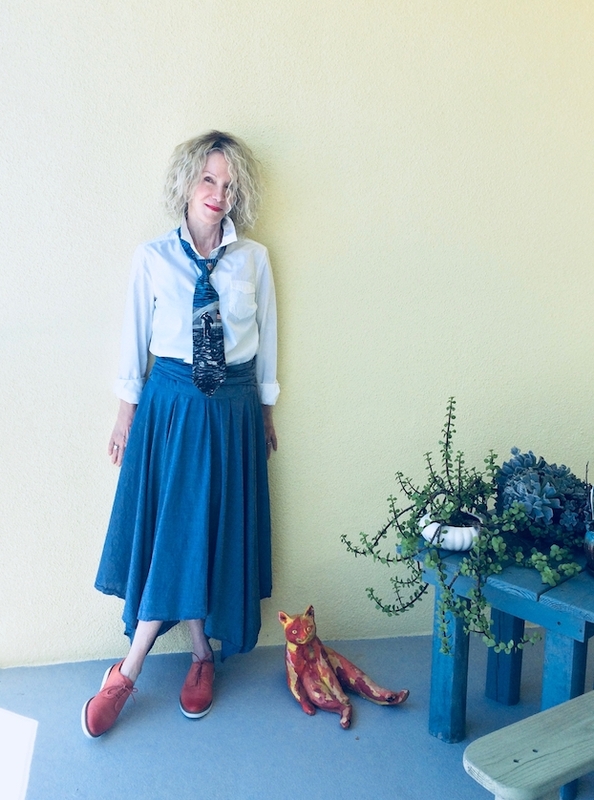 The billowy chambray skirt is a recent buy from the online thrift store, ThredUp. I’ve bought a few pieces from them, and they’re not all hits, but most work well – and you can’t beat the prices there. The white cotton shirt was thrifted locally and the cool oxford/sneakers are by Sofft. The skirt in its natural state. Kitty takes no sides on the cross-dressing debate. 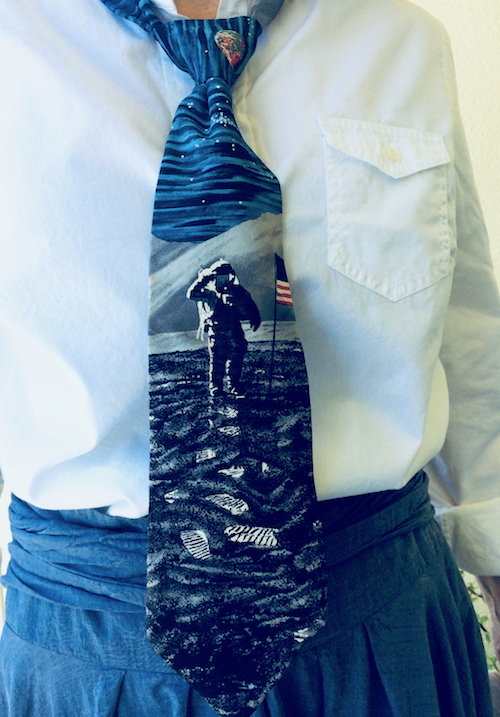 Sandy is an actual rocket scientist, and his favorite tie features Neil Armstrong. What a fabulous skirt! I love this outfit, and the tie is so unusual! I was sure that I was way too late to the party this week (so glad to discover that it wasn’t so) – but I came here to comment how absolutely gorgeous you look, Patti! I enjoyed Melanie’s interviews a lot, and you demonstrate some of the finest styles here yourself! i am intrigued by such elements as a tie or a vest, or fedora hat, but don’t often wear them. But when I find a cool tie like yours – I’m sure I will play with it too! This feels totally true to you Patti. That tie is probably a bit of an artifact and it had to be a rare find even when your husband purchased it. Uour little deck plants have gone crazy with growth. The jade plant looks healthy and very cool. You know, Sandy can’t remember when/where he found the tie, it seems to have just appeared! Thanks for noticing our wee bit of greenery, xox. Patti, you look amazing in that style! And your hair! I have curly hair that I continue to struggle with, but your cut is so cute! The tie is so fun as well. Thanks for sponsoring Visible Monday each week. Love the Androgenous style and your tie goes well with your outfit combining feminine and masculine together. Love this! It not too dissimilar to an outfit I wore at the weekend. Floral skirt but with a white shirt and brogues. I felt really good in it. Oh gosh this is a fabulous look! I love that tie and the hem on your skirt is so fun! Have a great holiday! I do love some masculine elements in a feminine outfit and you totally nailed it, so gorgeous, so stylish! and I love your shoes! comfy&cool! Such a fabulous outfit! Definite Annie Hall vibes. And a true blue honest to goodness rocket scientist? How fun! My son once did some sort of NASA project when he was in high school — loved it. Oh, that is the perfect denim skirt, Patti! I love it – what a wonderful shape on you. I love the androgynous/menswear look as well, and you are rockin’ it here! I often steal L’s ties for my looks, heh heh. That one’s awesome, nice, Sandy! Oh, Patti! That skirt is a treasure! I love how you’ve styled it with the tie and brogues. It really suits your creative nature while giving a solid nod to your inner rebel. I love it! I love this outfit on you Patti! The mix of masculine and feminine works beautifully. Slightly unexpected, which makes it all the more fabulous. Really rocking this look Patti! You wear this look so well Patti! That tie must really be a conversation starter, especially living on the space coast! This is so fantastic, Patti! I love a good androgynous look! You are rocking this look, for sure! I bought a few neckties for myself thrifting a few years ago and have yet to style them…I might be inspired now! Thank you for always offering me fun inspiration to run with! I love this androgyne look on you! You are made for this look! Fabulous outfit, love that skirt! The tie is amazing and you look fantastic Patti! My husband has some great ties, I think I need to borrow one! He has a floral tie from the ’60s, a tartan tie from Scotland, a Paisley tie and I bought him one with little VWs really cute and that would be perfect for me because I drive a blue Beetle. I can just see me in my long denim skirt, tartan Doc Martens and his tartan tie! Thanks for the inspiration. I’ll have to wait till fall, too hot right now! Oh, that tie is so awesome! I love a masculine/feminine mix, and you’ve done it so well here! You look absolutely fabulous in this Patti!! I’ve been loving my brogues lately, and I still have a couple of ties from the 90’s!! Since you love thrifted goods as much as I do, I’d love to invite you to join us for our #thriftedchicstylechallenge on Instagram. The post describing it will be on my feed tonight, or it’s always in my highlights too!! That tie is insane! What a conversation piece. Where did Sandy buy it? It must have come from a museum gift shop. This is a wonderful look for you. You look chic, comfy and relaxed. The trifecta! Can I tell you how much I love this? I am working on a piece of Chambray as I write. That tie-I need to find it for my son-in-law. You have so pulled of the feminine menswear look so successfully. And as far as the men, I am going to look for that tie for my son-in-law. That’s his main go to photo-his icon on Facebook.